The purveyor of handmade crafts mounted a comeback last year. What should investors be looking for in 2017 for the trend to continue? 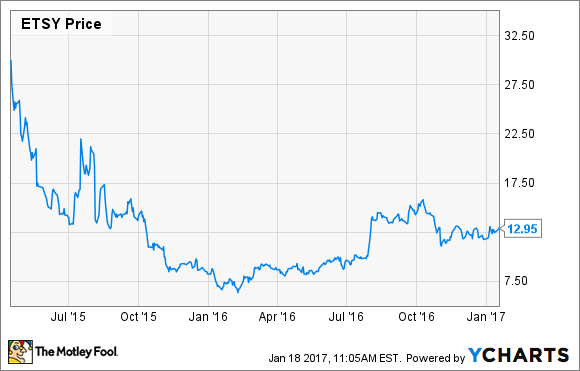 After getting clobbered following its IPO in 2015, Etsy (NASDAQ:ETSY) stock posted a solid 2016. Shares are still well off their initial offering price of $16, and even more off their high-water mark reached shortly after trading began, but 2017 is set to be a pivotal year for the upstart online retailer. Here is what investors should be watching. Etsy is a young online retailer that caters to artisans and craftsman looking to expand their reach in the marketplace. The company fits into a unique niche, even though its primary competitors are online heavyweights like Amazon and eBay. In the fall of 2015, the e-commerce leader tried to move in on Etsy's turf when it launched Handmade at Amazon, which also caters to the same market. Many investors feared the competition would cut into the growing sales and user base of Etsy. So far, the digital upstart has held its own. During the first three quarters of 2016, gross merchandise sold on its platform increased 20% over 2015. Revenue has increased 37%, up to $255 million. The company's active sellers and buyers have grown 11% and 20%, respectively, over the same period. The company has been able to fend off competition and continues to push its unique platform, but it has come at a cost. The company has been operating at a net loss for most of its life as a public company, while free cash flow dipped into the red recently as well. Management sees the demand for its platform continuing to rise in the years ahead. Gross merchandise sold is expected to grow 13% to 17% in each of the next two years, with annual revenue growth between 20% and 25%. That's a big step down from the numbers posted so far. That may be okay, though, as the management team has signaled more profitable days are ahead. As top-line growth starts to moderate, profit margins are expected to expand, which would go a long way. While still running a net loss on the year, Etsy is knocking on the door of profitability and even had a quarterly profit during the first quarter of 2016. Part of the reason for the persistent losses has been investments made to enhance its digital store and other features. For example, the company bought out artificial intelligence start-up Blackbird during the third quarter to help shoppers locate that specific item they are after. Etsy also announced other key feature rollouts like marketing enhancements for sellers who use Google Shopping Ads and a direct checkout option for sellers in Hong Kong and Singapore. The good news is that growth is starting to catch up to these strategic investments into the business. That means that as the top line expands, bottom-line profit should begin to move in the same general direction. Etsy's strong revenue performance last year was exciting for shareholders, and the chance for the company to start turning a profit this year makes things look even better. However, investors should exercise caution here. Etsy is growing at a fast pace, and that is baked into share prices. As a result, the stock can gyrate wildly on earnings reports if investors aren't satisfied with progress. The 2016 full-year report is due out in the next few weeks.